← Welcome to Calgary Applied Behaviour Analysis (CABA)! On March 29, 2012, the Center for Disease Control (CDC) reported that 1 in 88 children in the US has autism. There are no recently published rates for Canada, but Autism Speaks Canada indicates that the chances of a child being diagnosed in Canada are very similar: 1 in 110, with boys being 4 times as likely than girls to be diagnosed. Chances are you or someone you know has been touched by autism in a very personal way. April is Autism Awareness Month, and April 2nd is the fifth annual World Autism Awareness Day. Every year, autism organizations around the world celebrate the day with awareness-raising events in an effort to improve screening and referral practices, and advocate for the needs of individuals with autism and their families. 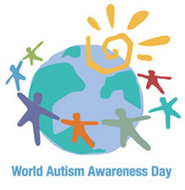 How are you planning on celebrating and creating awareness for autism? I haven’t found any events here in Calgary, but I’ve come across a number of really great online resources. The team over at Rethink Autism has just launched a video series for family members, friends and educators in an effort to promote autism awareness. The video gives an overview of the characteristics of autism and the early warning signs. To see the video, click here. As with any disability, early detection and intervention is crucial. Although much of what causes autism is unknown, what is understood is that early, intensive behavioural intervention (also known as EIBI programs) can have a profound affect on the quality of life of those children who are affected by autism. If you have any concerns about your child’s development, don’t wait. Speak to your doctor about screening your child for autism. And if you’re looking for an early intervention program or behaviour support plan check out our Services section, or Contact us!